AMC visited Munich for the first time and Prague for the second time. 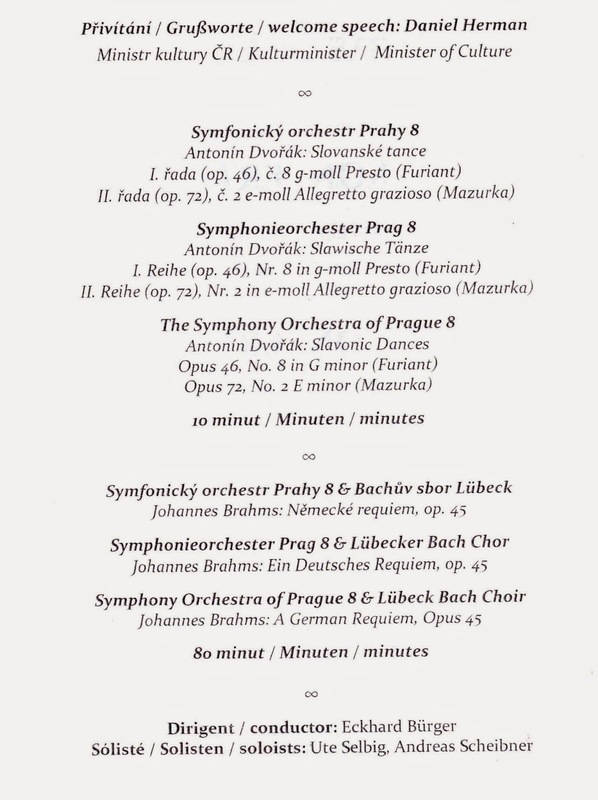 I was able to take in a concert by the Bavarian Radio Symphony (arguably one of the top three orchestras in the world), the Netherlands Radio Philharmonic (no slouch either), and two "tourist concerts" in Prague. AMC will discuss the latter two first. One of the "tourist" concerts was titled "Residenz Serenade" that was performed in the Hofkapelle in the Residenz palace by the Residenz Solisten. It is said to be the chapel in which Mozart played, although little of it is original since much of it was destroyed in WW II. The program was a veritable presentation of classical music's "Top Ten." It was much like listening to NPR these days. The Pachelbel Canon was played with one foot in the romantic style and the other in the Baroque style. The Atlanta Baroque Orchestra's recent performance was far more consistent in style and thus more rewarding. 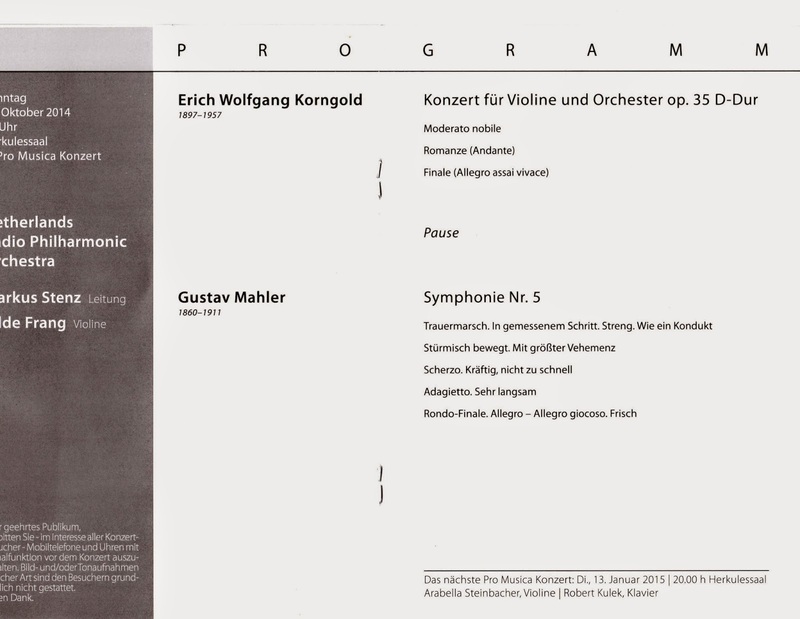 The rest of the program was mostly made of transcriptions of popular works for a string quartet. The chapel's acoustics were superb and the string quartet was quite good. Karsten Gebhardt, with long wildish hair, fit every stereotype of a" long-hair" musician and he played with technical finesse, saved for a few bowing errors. 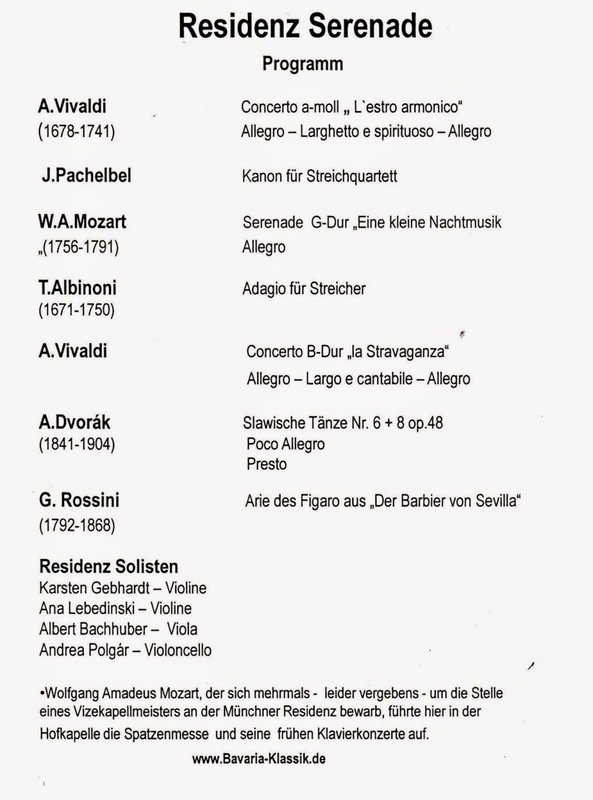 Ana Lebedinski, second violin, was very very good, especially in Vivaldi's "La Stravaganza." This was a pleasant concert but it grew wearisome for AMC after hearing one more Prague performance of Dvorak 's Slavonic Dances. He is, of course, the Czech Republic's favorite son composer. The second tourist concert was held in Smetana Hall of the Municipal Building. The building overall and the hall in particular are masterpieces of the art nouveau style that have been beautifully maintained. The performance was by the Symphony Orchestra of Prague (not to be confused with the Prague Symphony Orchestra or the Czech Philharmonic). The orchestra was made up of mostly very young musicians, with few gray or white haired musicians. AMC had to sit through another rendition of the Dvorak Dances. The main feature of the program was Brahms "German Requiem.' The orchestra was joined by the roughly 60-voiced Lubeck Choir. The conductor was one Eckhard Burger, who appeared to be more of a choral conductor as opposed to a symphonic conductor. A dead give away is that a choral conductor pays far more attention to the chorus. AMC is probably spoiled by the Atlanta Symphony Orchestra Chorus (although it is usually too loud as result of having too many singers in a poor auditorium), but the Lubeck singers were simply not up to the music. They seemed more like a big church choir, which is fine for hymns, but not so great for this great work. AMC was a bit underwhelmed by the acoustics of the hall. It seemed to have a mid-range "bump" that added a certain smear to the sound. But as an aside, there is no more sublime music than the second movement. Here is the piece played by the Stockholm Sinfonietta. Listen to the melody introduced at about :50. It is stunning. Now to the really great orchestras. The first was the Bavarian Radio Symphony conducted by Stefan Asbury. Asbury is a Briton educated at Oxford and the Royal College of Music. He’s chief conductor of the Northern Netherlands Orchestra and teaches during summers at the Tanglewood Music Institute in Massachusetts. The concert is part of the BRS's Musica Viva series, designed apparently to highlight contemporary composers. The first piece was by Brett Dean. Eight horn players gathered in semi-circle around Mr Asbury and had at the music. The most remarkable part of the performance was how well the musicians played. No blips, burps, or sliding into notes, which is quite a feat for the horns. 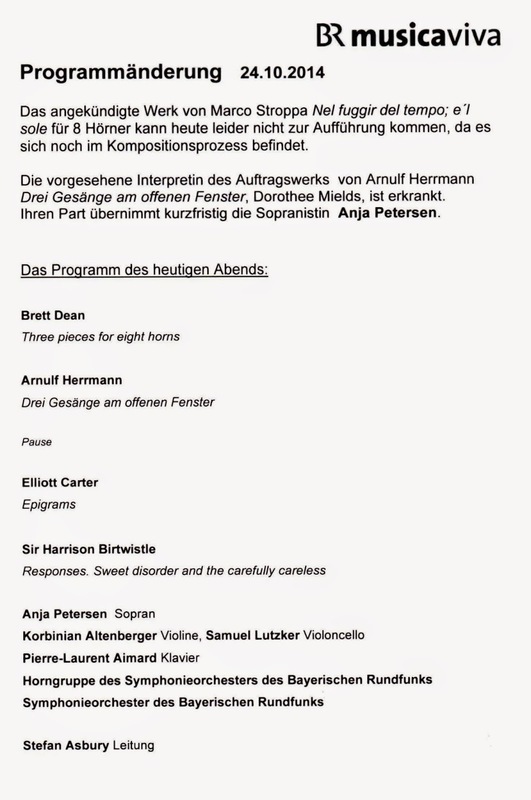 AMC was really impressed with how the eight horn players congratulated each other after the performance, especially the very young appearing first horn. 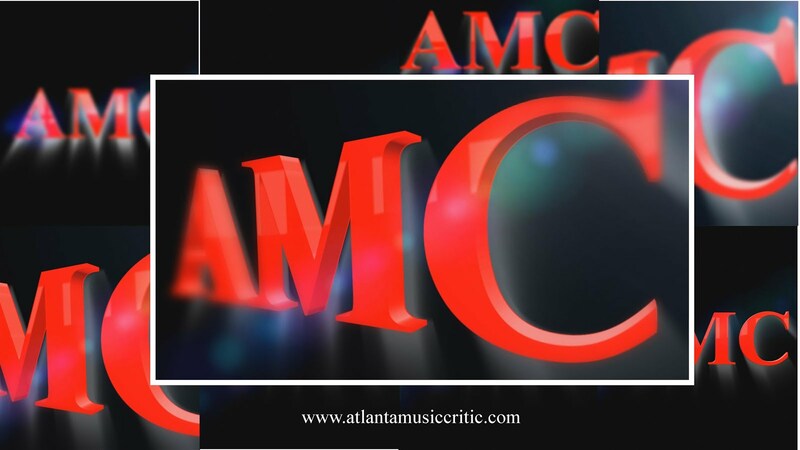 AMC siked the music; it had lyrical sections was well as some not unpleasant dissonance. AMC would like to hear it again, but it does not appear on YouTube for example. The second piece was composed by Arnulf Herrman, who teaches composition, analysis, and orchestration at the Hochschule für Musik "Hanns Eisler", Berlin. This music required a string quartet and piano. AMC can't say that it made a lasting impression except that the musicians from the Bavarian Radio were wonderful. AMC has never been able to get with Elliott Carter's music. The best thing about this piece, which AMC believes was Mr. Carter's final work, was that each of the many sections were mercifully brief. The final work on the program was Birtwistle's "Responses." for piano and orchestra. AMC like this piece and would have liked it even more if Sir Harrison would have deleted the piano part. The orchestral music was quite enjoyable. This concert was held at the Hercules Hall of the Residenz. It is a spare, smallish (1100 seats), and someone severe hall that has wonderful acoustics. AMC is convinced that a wooden floor, as in this hall, is essential to have a good strong bass line. there were in excess of 30 microphones recording the concert. AMC guess that why its the radio symphony! Even with this new music program, AMC estimates that approximately 90% were filled. As a side note, AMC had to pick up a ticket at the BR headquarters near the Hauptbahnhof. The ticket is packaged in a multi color sleeve much like the airlines used to use for their tickets. The ticket price also included a free round trip on the Munich tram. Finally, European orchestra's sell their programs. In this case, the program cost about $2.50 and is quite handsome with a perfect binding. The final concert was the supreme of the supremes. The violin soloist was Vilde Frang, who has appeared with the Atlanta Symphony. The conductor was the outstanding Markus Stenz. AMC is envious of the Baltimore Symphony as Maestro Stenz is becoming their new music director. AMC has never seen a conductor so in love with his musicians- he has a ready smile for each of them as he does his job and absolutely beams at them when the performance is over (he also has great hair and haircut but who cares). Ms. Frang flawlessly played the Korgold concerto. On occasion she had some odd posturing when she wasn't playing, such as turning her back to the audience to look at the orchestra when she was resting. But again, who cares as long as she played so well. The wonderful thing about the Hercules Hall and Maestro Stenz is that some of the subtle impressionist effects that Korngold hid in his music because more apparent. AMC had not heard this before in what is mostly a latter day Romantic concerto. But the pinnacle of perfection was the great Mahler Symphony No. 5. This was performed by the Netherlanders with such aplomb and skill that it was almost superhuman. The violins played with such unison that AMC thought he was listening to one very large violin. The brass were stunning, but always under control. The woodwinds were simply golden. Maestro Stenz carefully shaped each section from the podium. He obviously loves this music. The beautiful Adagietto was lovingly and touchingly played. (AMC watched Visconti's "Death in Venice" last evening, which features this movement). At the conclusion there were seven curtains and no unnecessary standing ovation. The principal players and Mr. Stenz were rewarded with roses. As someone said, the Netherlands Radio Philharmonic is the second best in Holland. But when the first is the Concertgebouw, the Hilversum-based Philharmonic is still among the very best to be heard. AMC agrees. AMC has a few additional observations. AMC so likes the European tradition of having the musicians walk individually on the stage while the audience applauds. AMC also likes that the orchestra members do not practice on stage; in the US they do this which leads to a pre-concert cacophony that is really unpleasant. Finally, there is far less gray and white hair in the audience than one sees in the US.